combine the best of solitary reflection and social interaction. Blogging is ideally suited to follow the plan for promoting creativity advocated by pioneering molecular biologist Max Delbruck. Delbruck’s “Principle of Limited Sloppiness” states we should be sloppy enough so that unexpected things can happen, but not so sloppy that we can’t find out that it did. My recent explorations with associational thinking included a brief walk down memory lane to my K-12 teaching days, an encounter with the Devil Shelves at the library and a quick visit to the shadowy world of the neo-luddites. It’s a tale that has little to do with traditional models of scholarship, but which may actually be an archetype of the kind of professional development that will dominate the lives of many practitioners. They take content from media providers and transform it, reinterpret it, republish it, take ownership of it in ways that at least hold the potential for subverting it. 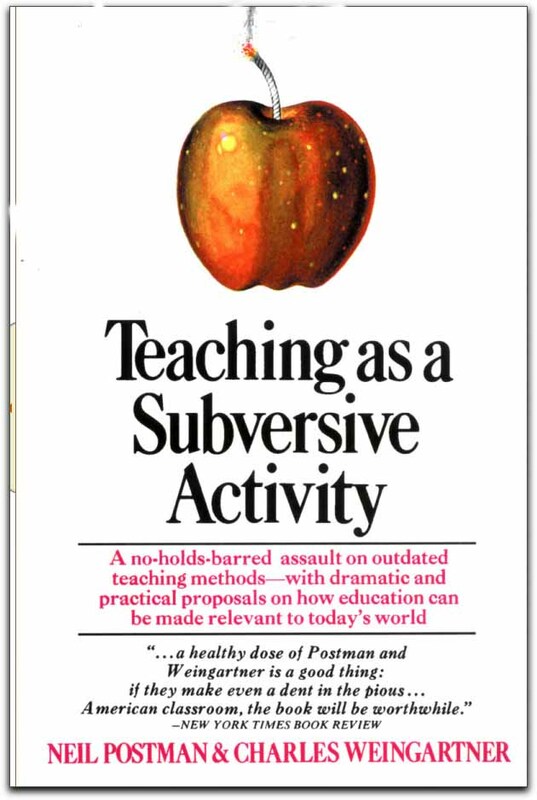 The words ‘subverting it” triggered an association connecting to one of the first books I read on educational philosophy, Teaching as a Subversive Activity. It was the ’60’s after all and subversive attitudes were all the rage. I’d just traded in my law school plans for the more idealistic vision of changing the world as a teacher. The only thing I actually remembered about the book was its focus on inquiry learning and the notion that education should be “real” rather than pretend. Gardner commented on the post and mentioned that Postman had published a follow-up book, The End to Education which was recommended by Amazon readers. (Neil Postman died in 2003. Lance Strate published an exellent summary of his work.) Reading Strate’s article intriqued me, and I decided to pick up the physical book at the library. (I confess I wouldn’t have made the trek to the library to get the book if it had been available through Google Print.) My trip to the library was made much more interesting my encounter with the devil shelves in the education section at the library. After an hour or so of three of us trying to jocky the compact shelving, we all decided that we preferred real shelves even if it meant fewer physical books in the library. One could start by by eliminating these bound copies of the Congressional Record. When it was my turn to use the shelves, I grabbed the Postman book, along with copies of Carl Rogers Freedom to Learn, which was probably the most influential source in shaping my personal philosophy of education, and its revision Freedom to Learn in the 80’s . I’m now re-reading those relatively carefully in light of our class discussions on technology in the K-12 arena and of the discussions we’ll be having on accommodating to the needs of the net generation. The final step in this journey through associative thinking came in my reading of the Strate paper in which he used the term neo-Luddite to describe Postman’s work. Neil Postman expanded his critical focus to include information technologies such as the computer and the Internet. In 1992 he published Technopoly: The Surrender of Culture to Technology, in which he explained that we accept technology into our lives automatically and uncritically, allowing it to penetrate every sector of American society and govern every aspect of human activity. This prompted some to label Postman a neo-Luddite, although he mainly argued for giving more thought to the unforeseen and negative consequences of technology, and for maintaining values, ethics, and social institutions independent of the technological imperative. For a while I had followed the efforts by a group of folks to start a conversation around the idea of technorealism. That conversation never really gained much traction, but neo-Luddite or new Luddite thinking still has a fairly large number of individuals asking serious questions about the philosophical underpinnings of our technological age. Martin Ryder, professor of education at the University of Denver, maintains a valuable collection of resources on this topic, including writings about Postman and Bill Joy’s famous piece on Why The Future Doesn’t Need Us. I think there are valuable insights here on how blogging can contribute to the professional development of those of us engaged in the practice of education. The imperative, even if self-imposed, to write regularly for an outside audience encourages scanning of a wide variety of sources. Invariably some of those sources will relate to genuine interests, questions and professional puzzles that are swirling around in your mind. Even a casual comment by a colleague can validate the legitimacy of the puzzle and lead to quick research and identification of unexpected resources. Those resources will often congeal around some (relatively) serious study in the more traditional sense. QED. Brilliant, moving example of narrating your work. I had a conversation with a poet-colleague recently in which she reminded me that Frost says a poem must ride on the ice of its own melting. I was reminded of that uncanny image of fixed fluidity as I read your entry here. I had not thought about the ‘neo-Luddites’, having had a focus on the original Luddites themselves far too long. It is true, however, that despite the proliferation of educational technology and training, that there is still a never-ending supply of instructors who shun technology in any format. They will not give up their overhead transparencies without a fight, or back away from the feeling that text messaging spells the end of civilized language. I don’t have any answers, and can only offer a continuous effort to reach those instructors who are technologically impaired, and show them what is available. Currently, I do this via a series of blogs and wikis, and soon plan on adding podcasts as well. I can say that the number of ‘hits’ to both my Adult Education/ Literacy academic training/informational blogs, and especially the interdepartmental communication blog gives me hope that, if technology is made as invisible as possible, educators will come to use it, and even rely on it to augment their classroom teaching. Next Next post: Wireless in the Classroom: Where’s the Kill Button?